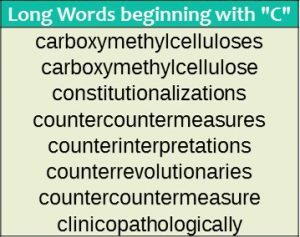 This section will provide you with more information on the words that start with C.
The letter C is the third letter of the English alphabet. It makes two distinct sounds – soft like \ s \ and hard like a \ k \. It also changes sounds depending on different letters that come after it, such as –h (church), -ia (special), and –s (luscious). It was originally the hump of a camel (Gimel) as used by the Phoenicians around 500 B.C, and it may have originally resembled a boomerang. The Etruscans used it for a K sound, and then the Romans took it as C after 9 B.C., adding a bar to it to use as a G, as well. The following are a couple of examples of words starting with C.
The desert men rode the camel to the oasis. Our car couldn’t beat the cheetah that was running across the plains. It was fascinating to watch the chameleon change colors. My brother likes me to lift him up to touch the ceiling in his room. Our family always goes to the cinema on Fridays to watch a movie. The boys pretended to mine for diamonds in the cave. As the girl struggled to get done, I realized she wasn’t capable. The baby looked around the playground with curious eyes. Walking around the mosaic walls was a cultural lesson itself. Her shirt was very colorful with at least three bright shades of pink. She finally shared the cryptic message on the sarcophagus. Our meeting was a ceremonial event, complete with awards. The little land plt was cropped and ready for the carrots to be planted. The crystalline table glimmered under the lights.